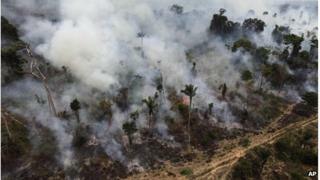 Brazil says the rate of deforestation in its Amazon region has fallen to the lowest level for 23 years. The National Institute for Space Research said 6,238 sq km (2,400 sq miles) of rainforest disappeared between August 2010 and July 2011, a drop of 11% from the previous year. The government says the fall is due to its tougher stance on illegal logging. But in at least two states, Rondonia and Mato Grosso, rainforest clearance rose considerably in the past year. The research institute has used satellite technology to monitor the rainforest since 1988. Destruction peaked in recent years at 27,700 sq km (10,700 sq miles) in 2003-4. The main causes of illegal clearing of the rainforest are cattle farming and agricultural crop production, as well as logging for timber. Brazil's congress is due to debate a reform of land laws in the next few days which would reduce the conservation area. The farming lobby says reform is needed as current regulations are a burden on production. But environmentalists say it would be a setback for efforts to preserve the rainforest.